Beignets (pronounced “Ben-yay”) are a beloved New Orleans specialty – soft pillows of fried dough, generously topped with powdered sugar. Everyone has a favourite and it’s a hotly contended issue. So let me preface this article by saying – this is purely my opinion, based on the method of eating as many beignets as humanly possible within 3 days. Hungry or not, I scarfed plate after hot, sticky plate of fried dough. All for you. In the name of science. Naturally, it was impossible to eat all the beignets in New Orleans in 3 days, so I focused on, what I have found to be, the three must-visit places. 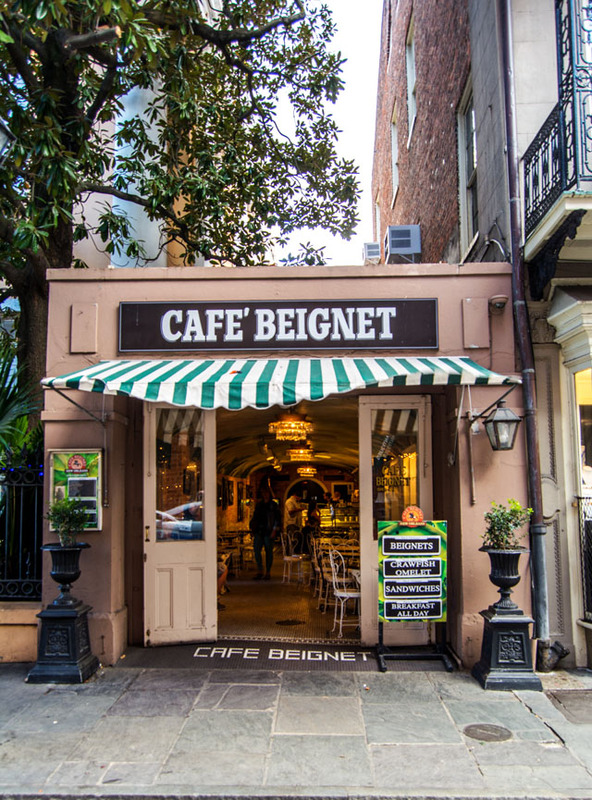 Café Beignet has three locations in the French Quarter, and I visited the one on Royal Street. This location has an adjacent courtyard with trees providing plenty of shade. I loved the ambience of this location – French bistro meets tropical garden with heart-shaped chairs. Also worth noting (since they seem to be very hard to come by), the washroom was clean. Café du Monde washroom is sketchy AF (you feel like you’re walking into the kitchen of the restaurant) and it’s a little rough around the edges. I’m not here for potty talk, I’m here to tell you about beignets. The beignets at Café Beignet were slightly crispy and a bit doughier than others. 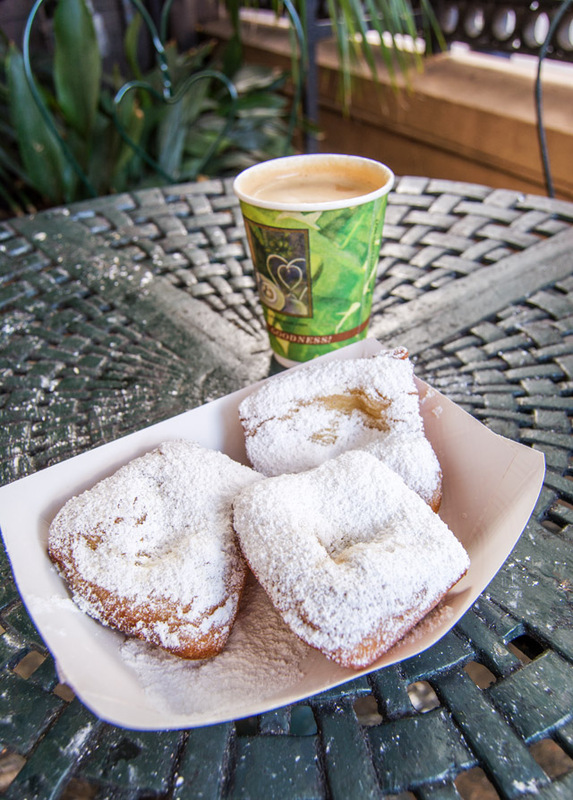 They are fairly light-handed with the powdered sugar, which was a nice change, as Café Du Monde piles it on. Taste-wise, they ranked as my 3rd favourite. Their coffee wasn’t anything special either. Le sigh. 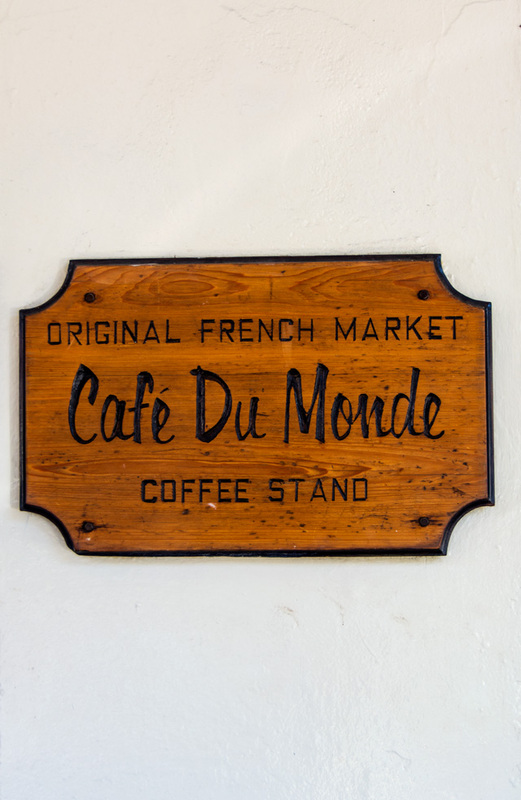 But, they have a pretty decent menu and they offer much more than just beignets and coffee. 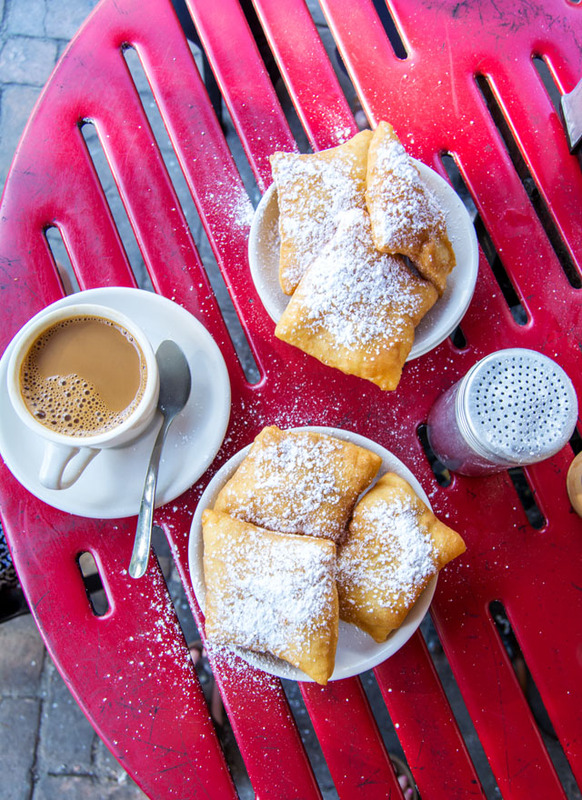 So listen, Café Du Monde is a must-visit in New Orleans, no matter what – even if it’s just to say you’ve been there. It’s rich with history, has decent coffee (I actually buy their chicory coffee at home all the time and use it for iced coffee), and is a great spot for people watching. They’re open 24 hours a day, 7 days a week, located right on Decatur, across the street from Jackson Square, which makes it one of the most convenient places to grab a beignet. During the day it’s tough to grab a table, but when you do, be wary of powdered sugar on the chairs, and sticky tabletops. Better yet, grab your order to go, and sit on a bench by the Mississippi – it’s quieter there, and has a nice view. 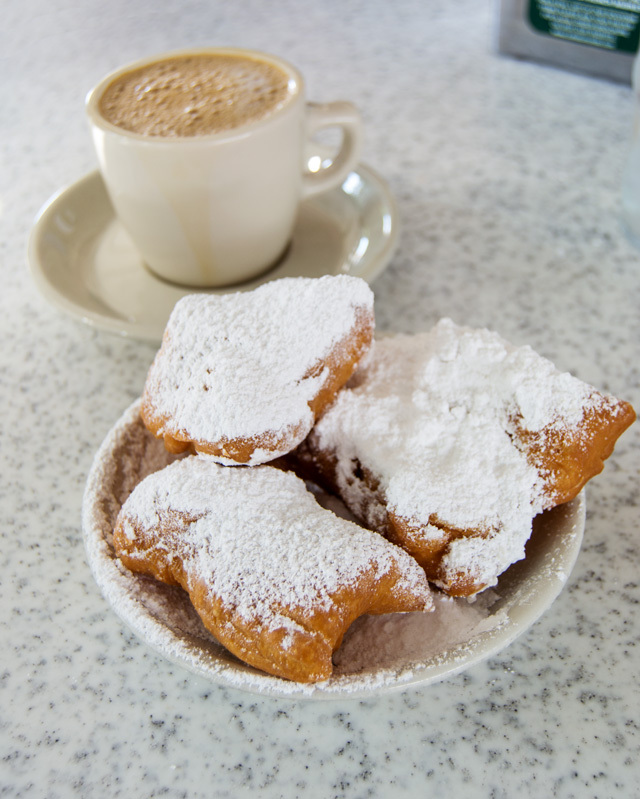 The beignets at Café du Monde come piled high with powdered sugar – more than any other restaurant I’ve visited. It’s here, that I’ve perfected my beignet eating technique. First, dust off a little sugar. Second, don’t breath while taking a bite. If you breath out, you’re going to send powdered sugar flying. If you breath in, you’re going to be snorting sugar, and that ain’t fun. As for the beignets themselves, they fall middle of the pack in terms of greatness. Part of me thinks they’re hailed as being the best because they’re so fresh. It’s probably fair to say they crank out more beignets than any other establishment in the city. Beignets at Café Du Monde were certainly fluffier than Café Beignet, but not by a whole lot. But still super awesome and delicious and I will still always stop in at Café Du Monde when I’m in town. 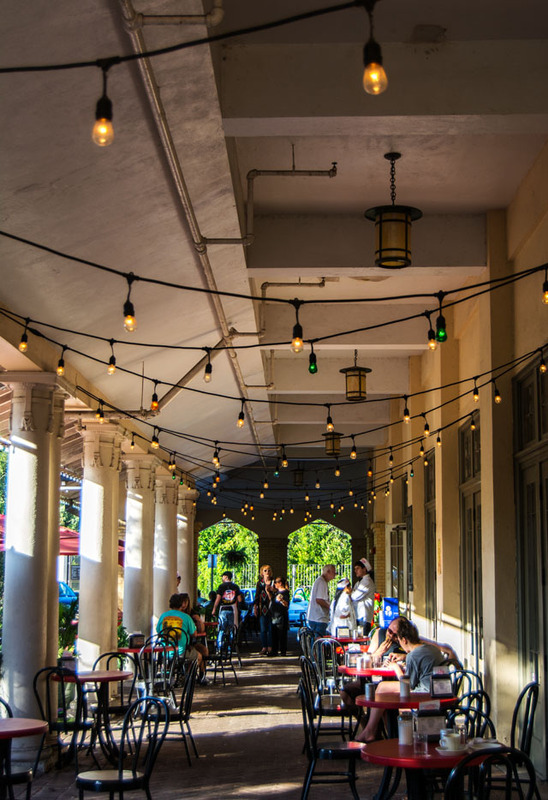 My favourite place in all of New Orleans to get beignets is Morning Call, located in the beautiful New Orleans City Park. You’ll probably want to hitch a ride on the Canal Street streetcar to get here, but it’s SO WORTH IT. The park is gorgeous, and there are a ton of things to do other than get fried dough. It’s a quiet change of pace from the bustle of the French Quarter – and the restaurant is gorgeous, too. The coffee at Morning Call was the best we had of all three places. We tired café au lait as well as the iced coffee and both were winners in my book. We even got an iced coffee to go – so good! The beignets are served naked, and you add as much or as little powdered sugar as you want. Pro: You control the amount of sugar you ingest. Con: You make one hell of a mess. The beignets at Morning Call were the best – slightly crispier exterior and by far the lightest and fluffiest of them all. Turns out, this is exactly how I like ’em! I’d love to hear how you rank the beignets in New Orleans. Any other great places I should check out that serves them? How about savoury beignets? I had a crawfish beignet at Katie’s Restaurant and it was awesome, too.